This biography was written almost twenty years ago but it has remained the standard biography of this oft-discussed, and oft-maligned, nineteenth-century revivalist. Finney is known for his revivals and his revival theology, his systematic theology, and his socially progressive anti-slavery work at Oberlin College. Whether you want to hear about Finney’s famous conversion story, his “Anxious Bench”, his protracted meetings, or his perfectionism then this is the place to go. It is a book fully conversant with cutting-edge historical studies even though there are no footnotes or endnotes. Finney is often seen as a pragmatic revivalist who advocated for a perverted Arminian or maybe even a semi-Pelagian view of human depravity. 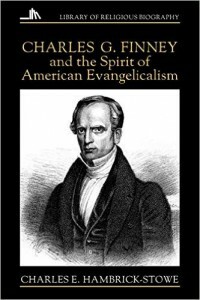 Hambrick-Stowe does a great job in explaining that Finney is best seen within the Calvinism that came from New Haven and Nathaniel William Taylor in particular. This recognition, though a bit technical, helps explain Finney quite a lot. In short, rather than seeing depravity in the constitution of humanity Finney saw it as a depravity of will in the lines of Taylor. This explains how his perfectionism differed from the Wesleyans. Just as Taylor’s theology did not carry the day and eventually wore out, so did Finney’s. Yet, the theological and social-ethical themes that Finney dealt with continue even into modern day American evangelicalism. This, and the fact that Finney is an amazingly interesting figure, makes the book worth reading. I am no Finneyite, but this book was great to read.